Back in October, the Yankees fired Hitting Coach Kevin Long and First Base and Infield Coach Mick Kelleher. Three months later, and just a month from when Pitchers and Catchers will report to Spring Training, they finally hired replacements for these guys, ending an off-season long mystery that even Shaggy, Scooby and the rest of the gang couldn’t have predicted would end up like it did. The team actually hired three coaches to fill the two spots. The offense was so bad last year, that they thought it needed a two-coach approach – the first in team history – to fix. They brought in Jeff Pentland (above, left) to be the Hitting Coach, and Alan Cockrell (above, right) to be his assistant. As far as the Infield Coach job goes, they brought in Joe Espada (the guy in the middle) to take over that role. It is assumed right now that Espada will also coach first. Who the hell are these guys? I had no idea until they were signed, so let’s find out together. It’s safe to say that, coming into the season, Jeff Pentland was not on anyone’s radar for this position. We petitioned earlier this off-season for Marcus Thames to get the job, but the Yankees didn’t give it to him. At least he will stay within the organization, as the Yankees named him the hitting coach at AAA Scranton/Wilkes-Barr. Thames , who was the hitting coach at AA Trenton last season, is basically climbing through the Yankees system for the second time – the first being in the early 2000s as an Outfielder. Anyway, the big red flag with Pentland, it seems, is the fact that he’s 68 years old. Some fans and reporters seem to think that the Yankees, who have been concsiously instituting a youth movement with their roster, should have done the same with their coaching staff. Despite his advanced age, Pentland seems to be very qualified for the job. 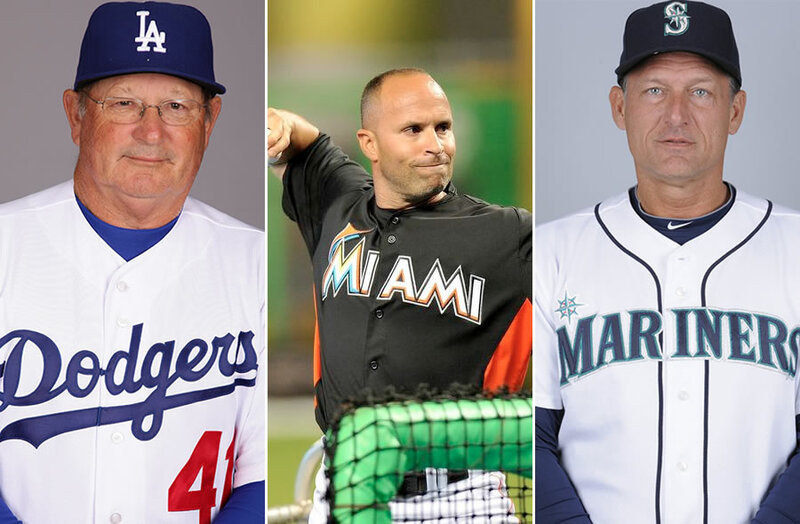 He has a ton of experience as a Major League hitting coach, with stints coaching the Dodgers (2008-2011), Mariners (2005-2008), Royals (2003-2005) and Cubs (1997-2002). His ties with the current Yankees coaching staff are deep as well, as he was current Yankees Bench Coach Tony Pena‘s hitting coach on the Royals and Joe Girardi‘s hitting coach in Chicago (where he was joined by current Yankees pitching coach Larry Rothschild and Jim Hendry, a special assistant to Brian Cashman). Pentland has also worked with Carlos Beltran in the past, so maybe he’ll be able to help the Yankees’ Right Fielder recapture his swing from 2013. In Cockrell, the Yankees have a Janine to Pentland’s Ghostbusters. While Pentland focuses on what he does best – getting inside hitters’ minds and telling them what’s going wrong according to Gary Sheffield a, Cockrell will be handling the day-to-day stuff for the team (I assume answering phones, picking up dry cleaning, and keeping city inspectors away from the Ecto Containment Unit.). Cockrell is not short on experience himself, having spent time as a hitting coach all over the Rockies’ minor league system (including a brief stint with the big league club in 2002) and as the Mariners Hitting Coach from 2009-2010. Will this two-headed approach work? If these two guys are on the same page as far as strategy goes, then this should work out just fine. As long as it’s known that Pentland is Mr. Peterman and Cockrell is Elaine, then this should work out great. Pentland will be able to focus on strategy and improving the hitting performance, while Cockrell can execute his theories. Plus, someone’s gotta collect the balls after batting practice. Kelleher is not Irish for “Sword,” and so this man was fired. Now let’s talk about Joe Espada, the new Infield Coach. Espada, whose last name means “sword” for those of you non-spanish speakers (now laugh at my punny headline), does fit the Yankees youth movement a little more, as he is only 39. He spent several years as a hitting coach and infield coordinator in the Marlins’ minor league system, and coached Third Base for the big league club from 2010-2013. Last year, he worked as a special assistant to Brian Cashman, so he knows a little bit about this team as well. The infield defense was pretty horrible last year. This year, the Yankees have definitely upgraded that, bringing back Chase Headley for four more years, signing Stephen Drew (and possibly bringing up youngsters like Jose Pirela and Rob Refsnyder at some point) and trading for DiDi Gregorius from the Diamondbacks. I think the new talent, along with a different coaching approach, could really benefit everyone involved. The Yankees need to focus on run prevention this season, and Espada should be an upgrade over Kelleher. It’s assumed he’ll coach First Base as well, but I kind of hope they make him the Third Base coach, and either fire or move Robbie Thomson somewhere else (sigh. I know they won’t fire him).